Arrowood by Laura McHugh. Spiegel & Grau, and imprint of Random House. 2016. Review copy from publisher. 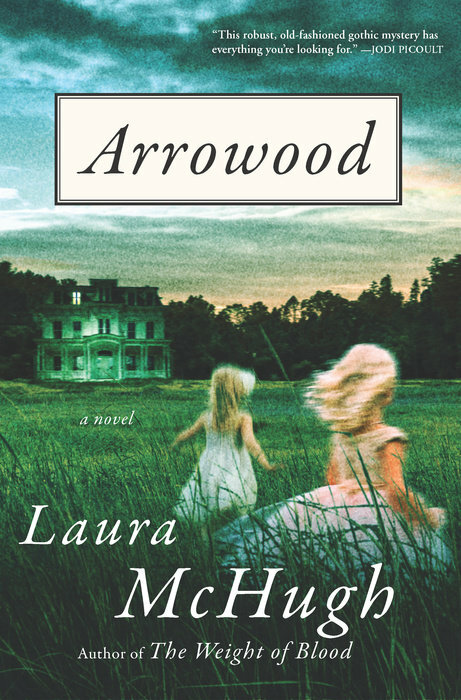 The Plot: Arden Arrowood is returning to her hometown after twenty years away. Twenty years ago, while she babysitting her twin toddler sisters, she stepped away from a moment -- and they vanished. Before: Arden and her sisters and their parents and their grandparents, in the big family house in Keokuk on the Mississippi River. Picturesque and perfect. After: it all falls apart. First Arden's parents leave Keokuk, moving from place to place until they divorce and each builds a new, different life. Arden drifts, in her own way, unable to finish her graduate degree, unable to commit to anything permanent. Now: Arden's father has died, and she inherits the family home. The home that was the last place she saw her sisters. Arden returns, for many reasons. Because she has no place else to go. Because once it was home, and no matter where she has lived, it's never been home. And maybe, just maybe, the mystery of the twins can be solved. The Good: I love a gothic mystery, and this is a present-day, present-time gothic mystery. Arrowood takes and twists and updates these elements. Instead of a castle, there is the old family home, where generations of Arrowood's lived before Arden and her parents and her grandparents. And it's a big home, almost abandoned in the years since her sisters were kidnapped. No one wanted to live there anymore, so when Arden comes home it's to a house that is almost frozen in time. One nice spin is that even there Arden has a legacy of a family name and home, that legacy, to be blunt, doesn't include money. Arden's financial concerns aren't limited to her own needs. It's also the town of Keokuk, which is a place that is no longer as vibrant as she remembers, is a place with shuttered stores. It's fallen on harder times. Old family friends have stayed, and Arden has to decide what her role, if any, will be in the town of Keokuk. Keokuk as a setting is key, and I confess at first I thought it was a made up location until they started naming famous residents and I recognized a name and looked up to the town and saw it, and some of the history in the book, was real. There is mystery and suspense: what happened to those little girls? As grown up Arden begins to look into the past, she discovers secrets about her parents and grandparents that make her question her memories, as well as how she now views her parents. And there is Arden herself, who I liked in part because she isn't perfect. Her returning to her childhood home is in some ways a running away from her current life, and part of her realizes that, as she tries to figure out what to do and how far to pursue the truth. Where Arden's search ends up raises lots of questions, not all answered by the end of the book, and that's part of what I like about the book. I want to talk more about her parents, and her mother, and her father, and her grandparents, and what is said and not said. And I want to talk about those twins.